Welcome to the award-winning Cheapest Destinations Blog, up since the dawn of the blogosphere and written by an expert on where and how to travel well for less money. That would be me, Tim Leffel. I help people figure out how to travel well for less and show them where they’ll get the most bang for their budget. 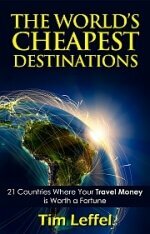 I write about the cheapest places to travel as well as great places to live abroad for less. If you pop by here regularly, you’ll probably go amazing places and experience amazing things for less than you thought it had to cost you. I’m not some recent college grad out for my first trip around the world, so instead of naive wonder (not that there’s anything wrong with that…) you’ll get more than two decades of perspective. With a dash of cranky skepticism. 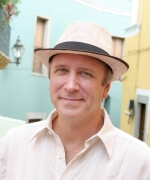 I am a travel writer first and foremost, also an author and editor. I have circled the globe three times and dispatched articles from five continents. I am author of The World’s Cheapest Destinations — currently in its fourth edition — and the Travelers’ Tales title Make Your Travel Dollars Worth a Fortune: The Contrarian Traveler’s Guide to Getting More for Less. I am also co-author of Traveler’s Tool Kit: Mexico and Central America and author of Travel Writing 2.0, which is now in its second edition. 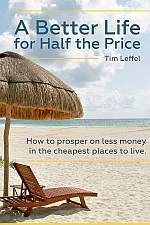 My best-selling book lately is A Better Life for Half the Price – a guide to how to cut your expenses in half by living abroad. 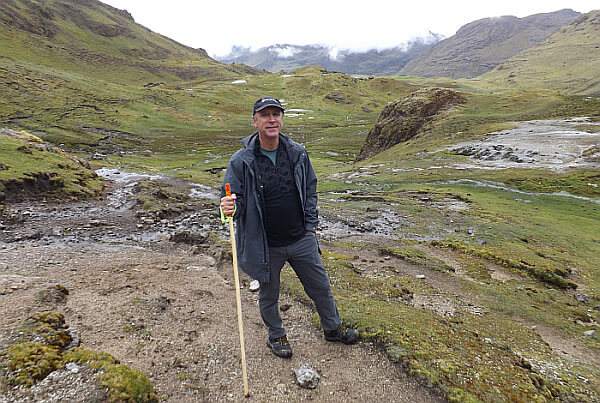 I am editor of the narrative web publication Perceptive Travel, which is known for publishing the best travel stories on the web, and founded the leading travel gear review blog Practical Travel Gear. (Which I sold in mid-2015 to free up some time.) I run this travel writing blog connected to the writing book. As a younger man I worked a few corporate gigs, hung out with celebrities while being a marketing maven at RCA Records, lived in Turkey and Korea teaching English, and have a house in Mexico where my family lives off and on. 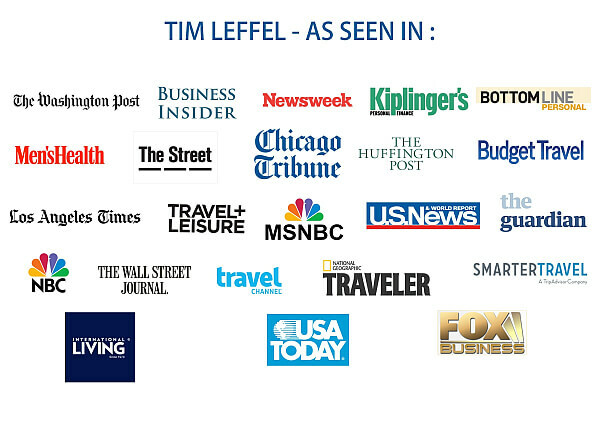 I have won a whole slew of writing awards for work in a variety of print and web publications and have been quoted as a budget travel expert in more than 50 major media outlets. This blog is an award-winner too: it has scored a Gold, Silver, and Bronze over several years in the annual writing awards from the North American Travel Journalists Association. It has also won “best travel blog” awards from Forbes, Tripbase, USA Today’s 10Best, and others. Individual stories I wrote have won Solas Awards and my Perceptive Travel Blog won a Lowell Thomas writing award from the Society of American Travel Writers. I was voted one of the 12 most popular travel bloggers in a poll at Elliott.org and this is one of the most popular travel blogs in the world by traffic. Wanderlust magazine picked this blog as “One of the top travel blogs you must read.” To learn more about me, get contact info, and see clippings, visit TimLeffel.com. If you really want to know more you can read an interview with me in Nomadic Matt, Mint.com, JetsLikeTaxis, the Freelance Zone, Writers Weekly, or The Gift of Travel. Here’s a “week in the life of” thing I did while living in Mexico for The Professional Hobo. I’ve been on a slew of podcasts, including Amateur Traveler, Zero to Trave,l Extra Pack of Peanuts, and The Suitcase Entrepreneur. I get interviewed a lot in major media outlets like USA Today, Kiplinger’s Personal Finance, The Street, and Travel + Leisure. If you’re a journalist looking for a quote or more insight, click the “contact Tim” link in the right sidebar. I’m a husband and dad, so I’m not on the road non-stop like some other bloggers, but I do travel internationally a half-dozen times each year at least and own real estate in Mexico. This blog has been up since 2003 (past 1,450 posts) and I’ve purposely lost count of how many countries I’ve visited. It’s not a contest; it’s a journey. Thanks for coming along for the ride. You can follow me on Twitter (@timleffel), on Facebook, or reach me by e-mail: tim (at) timleffel.com. If you’re a journalist on deadline or a partner trying to connect on a sponsorship deal, call me at 813-203-5595. If you want to work with me, here are some real stat numbers for you, pulled straight from the traffic logs. 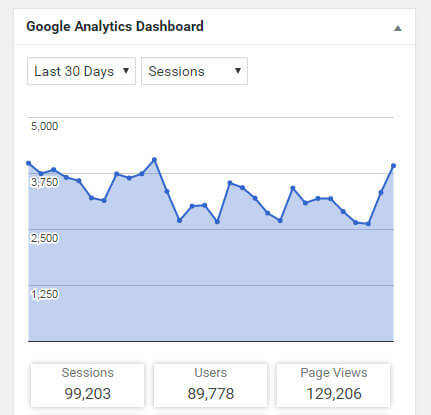 I average 60K to 80K unique visitors per month and these readers stick around for a while–an average of three and a half minutes. Keep in touch! You can get the posts by e-mail or RSS, there are social follow buttons, or you can get on my Cheap Living Abroad list and get a free report on where you can stay more than three months on a tourist visa.